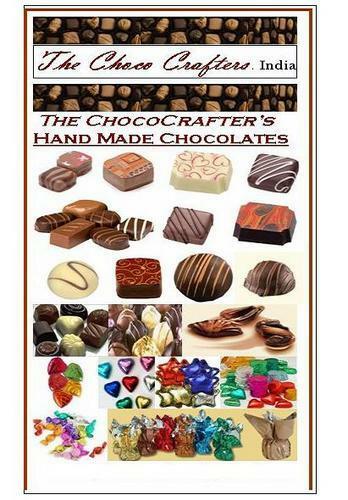 Choco Crafters are Mumbai,India based Handmade chocolates Manufacturers, We manufacture a wide range of molded Chocolates with variety of fillings in different sizes & shapes. We are well established & Experienced in the market having substantial manufacturing capacity,capabilities & adequate facilities to undertake large Chocolates orders & are dealing with large organizations and corporates for their large Corporate Gifts, Business Promotion Chocolate Gifts,Events Gifts etc. For over a decade 'Choco Crafters' has built itself to be a renowned company specialized in handmade Chocolates,Creating its Brand & market. Through contract manufacturing & private label manufacturing, the company has created radical change in the Indian chocolate Market by creating a market for Contract Manufacturing & outsourcing it's manufacturing capabilities and capacity to partners for chocolate private label manufacturing. We also work with Retail Stores & large Chocolate & Confectionery manufactures & cater to their requirement in manufacturing of chocolates with their Brand name or label, We solicit enquiries and orders for molded Chocolates on contract manufacturing or on job work basis.